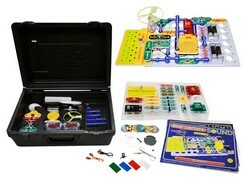 The light & sound combo kit from Snap Circuits combines two of the most popular educational kits: the Snap Circuits Light Kit and the Snap Circuits Sound kit. Combining these two into a single kit with more than 65 parts, you now have over 350 exciting projects that will either be just light or sound, or a combination of the two. Some of the projects include a voice changer, fiber optic light show, and a glow-in-the-dark fan. The kit comes in a sturdy plastic storage case for easy storage and transport, as well as illustrated project guides that will detail how to go about creating the various projects and learn about light and sound. It requires 4 AA batteries (not included).